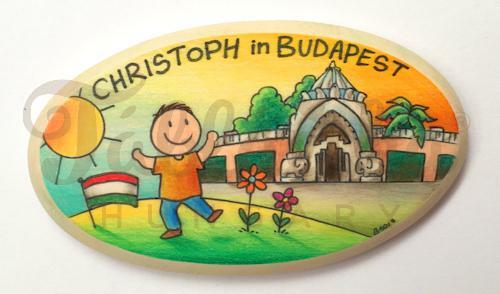 Get your own personalized Táblácska plaque from Budapest! It is a great pleasure for Táblácska Hungary to cooperate with Minicards. This unpronouncable Hungarian word “Táblácska” means: “little plaque”. 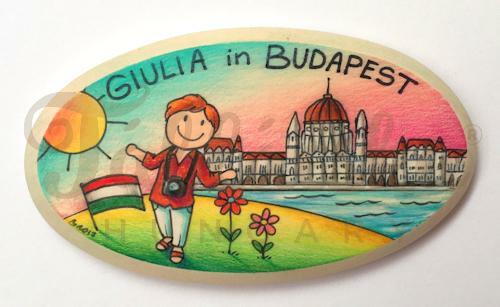 Táblácska is also an original Hungarian lovebrand that has more than 160,000 fans on Facebook. We are working hard to make it an wide known brand. Táblácska is a unique, hand-made, personal gift. No one else will have this, because it is you who find out what you want it to be like. Táblácska is made from an oval wooden board. The Táblácska will be made based on your idea: a person + a sight in Budapest that you choose + a name and a title in a language chosen by you. You can have one for every member of your family. 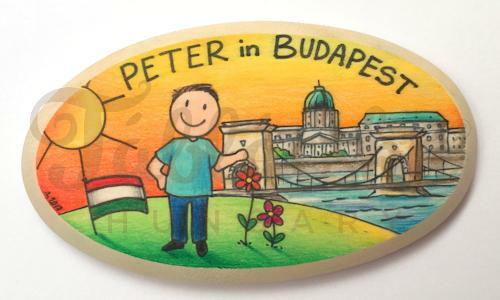 Your favourite place in Budapest is Chain Bridge and Buda Castle. You are a young male with short brown hair. Your favourite place in Budapest is Parliament. You are a middle-age women with short brown hair. Your favourite place in Budapest is Zoo. You are a boy with short brown hair. Every Táblácska will be delivered to your room number at the reception within two days from your order. After ordering, we will soon send an e-mail with the pro forma invoice and the necessary details for the transfer. Please transfer the amount as soon as you receive the invoice, however, the payment will not affect the delivery time. You can find the account number and the information needed for the transfer at the top left section of the pro forma invoice. When transferring, enter the unique identifier code of the order (e.g. D-TBL-19658, in the upper left corner) into the “message” field. After the payment has been received, we issue an electronic invoice, which will be sent by email. You will receive this invoice sent to the address of the given hotel (it will be delivered to your room number at the reception) within two days from your order. Thank you for choosing Táblácska!